Cameras: Contains all the cameras of the project. One camera is associated to each image. Rays: Allows to show / hide the rays between selected points in the model and the cameras where the point has been found. Contains the rays display properties. Tie Points: Contains the Manual Tie Points, GCPs, Check Points and Automatic Tie Points. Processing Area: (available only if a Processing Area exists) Contains the Processing Area. 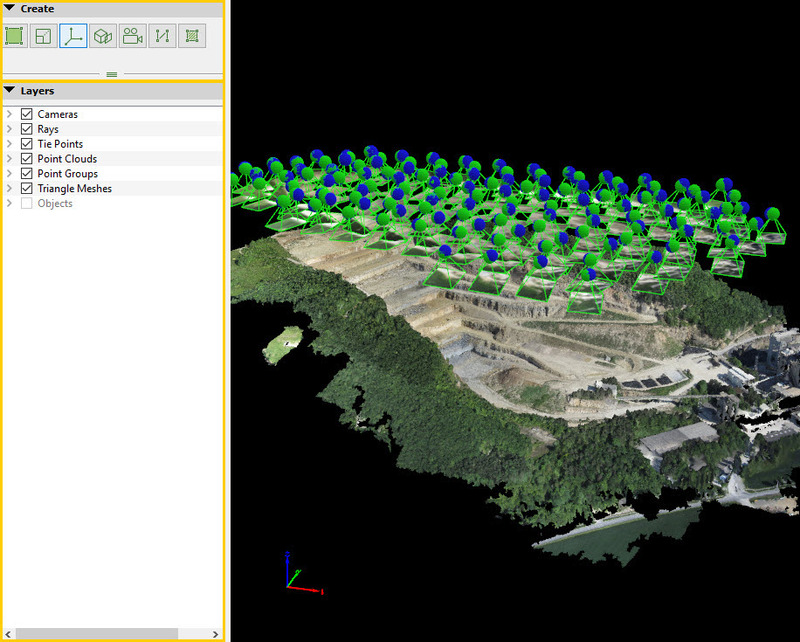 Point Clouds: Contains point clouds (Densified Point Cloud and loaded external point clouds). Point Groups: Contains the different groups of points (each point of the densified point cloud is assigned to one group). Triangle Meshes: Contains Triangle Meshes (generated in Pix4Dmapper or imported). Objects: Contains any drawn object: Polylines, Surfaces, Video Animation Trajectories, Orthoplanes, Scale Constraints and Orientation Constraints. By clicking on the left arrow of a layer, the sub-layers and layer properties are shown or hidden. By clicking on the a layer's check box, the corresponding layer is shown or hidden in the 3D View. The different layer properties can be edited. Some layers have a context menu that can be accessed by right clicking on the corresponding layer.